Our speaker was Prof Andrew Coates from Mullard Space Science Laboratory which is part of University College London, although it is actually situated in a converted mansion near Dorking, Surrey. This year marks his 30th anniversary of beginning his work in the field of plasma physics and he heads the Planetary Science Group at MSSL. Their main research is concerned with studying how the solar wind interacts with planets and comets throughout the solar system. In the early hours of 9th November 2005 the ESA spacecraft Venus Express was carried into space aboard a Soyuz-Fregat rocket. One of the instruments on the spacecraft was ASPERA-4 which the team was involved with. 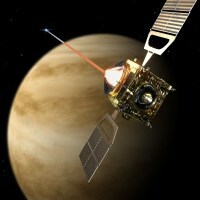 This instrument was designed to analyse the solar wind and its interaction with the Venusian atmosphere. Although Venus is sometimes called Earth's sister planet due to its similarity in size and composition it has taken a very different evolutionary path. It is totally covered in clouds of sulphuric acid and has a dense atmosphere of carbon dioxide. At its surface the pressure is 92 times that on Earth and the temperature is hot enough to melt lead. It is thought that it used to have oceans of water in the past but, lacking a carbon cycle to sequester the carbon from volcanic gases, the runaway greenhouse effect heated the atmosphere and the water boiled off. Having escaped into the atmosphere the water vapour would then be split into its respective hydrogen and oxygen atoms by energetic photons from the solar wind and the lighter hydrogen would be lost to space. Given the hostile conditions of the atmosphere and at the surface it is not surprising that it took many attempts by the USA and USSR before a spacecraft achieved a successful landing with Venera 13 returning the first colour photographs from the surface. Since it first entered its near-polar orbit in April 2006, Venus Express has given scientists a fascinating insight into our neighbouring planet. It appears that mass loss from the upper atmosphere is accelerated when a section of the magnetic field surrounding the planet effectively breaks off. This was a great surprise to the scientists as they did not expect this effect as Venus has no magnetic field of its own just a small induced one due to the solar wind interacting with the planet's ionosphere. Another striking discovery was of the existence of a chaotic double vortex of clouds at the south pole with a centre of rotation slightly offset from that of the geographic pole. More recently an ozone layer has been seen and lightning has been confirmed although the average rate has still to be determined. There are still many unanswered questions that still need investigating. For example, why does Venus rotate so slowly and in the opposite direction to most planets so that a Venusian day is longer than its year, and what would account for the speed of the atmospheric winds being 60 times that of its surface? Perhaps Venus Express' extended mission until 2015 can help answer some of these puzzles.